The Game DVR feature of the Xbox app enables you to capture gameplay video clips, which you can then edit and share with your friends inside and outside the Xbox Live community. How do I edit my game clips? How do I share a clip on Xbox Live? Can I share my clips through Facebook, Twitch.tv or other social media services? 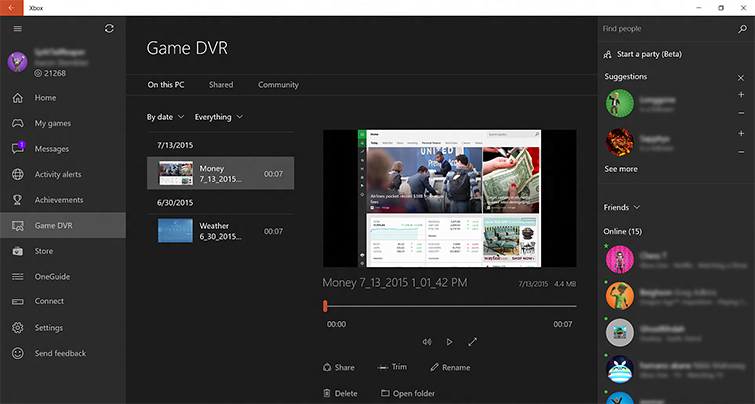 From the Game DVR screen within the Xbox app, you can access and edit all game clips recorded on Windows 10, as well as clips shared from your Xbox One. Editing in the Xbox app is restricted to Trim at this time, but it’s perfect for taking just a little off the front and back to focus on one moment. There are two tabs you can choose from when selecting a clip to edit: On this PC and Shared. On this PC: Shows all game clips that were recorded on this PC. You can sort By date or By game. Shared: Shows clips that you recorded and shared to your Activity Feed. 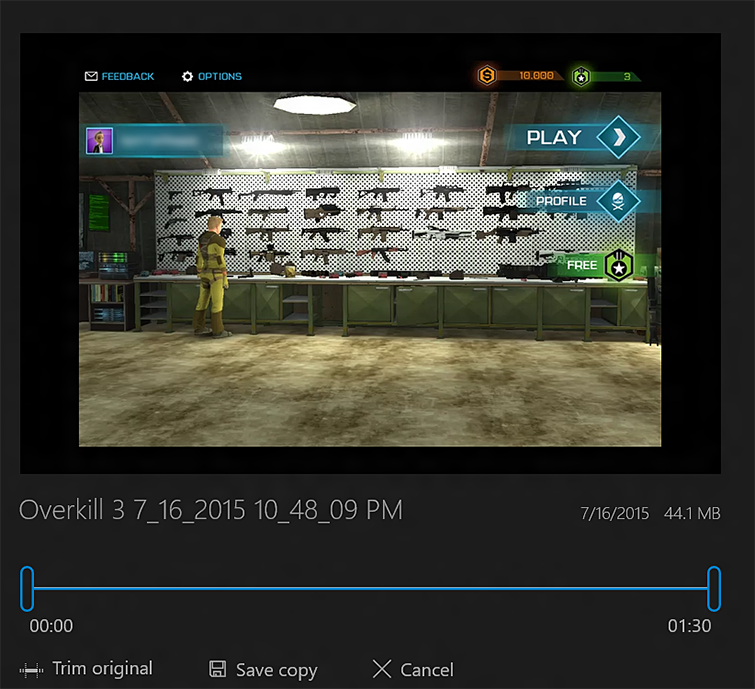 This tab also allows you to access game clips recorded on your Xbox One. You can sort By date or By game. Note To edit a clip from the Shared tab, you must first download the clip to your PC for editing. To do this, select the clip and then the Download button, located below the playback window. Choose the Community tab to see clips from the community that are trending as the most watched, liked or shared. You may like, share or comment on community clips, but you can’t download or edit them. Once you’ve selected or downloaded your clip, you can trim it to further personalise the video. Selecting a clip loads it into the preview player, where you can play it back in its current form. Move the left bar or the right bar towards the middle to trim length off the beginning or the end of the recording. When you’re satisfied, select the Save copy button to finalise your edits to the clip. Game clips are originally named with the game title, the date and the time so that you can quickly find it, but you can change the name prior to sharing with the world. Selecting the name of the clip makes the title editable. You can then choose a name for your clip and, optionally, a tag to better help sort it. 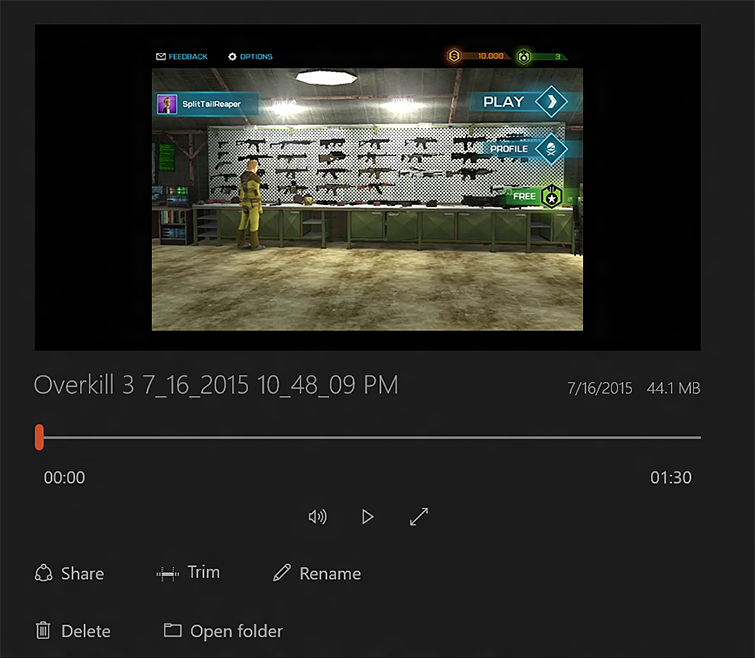 Once done, the clip is ready for uploading to Xbox Live. Highlight the clip to share. Select the Share button. A notification will pop up at the bottom left of the Game DVR screen, showing you the progress of the game uploading to your Activity Feed. Yes, you can share your clips to social networks. 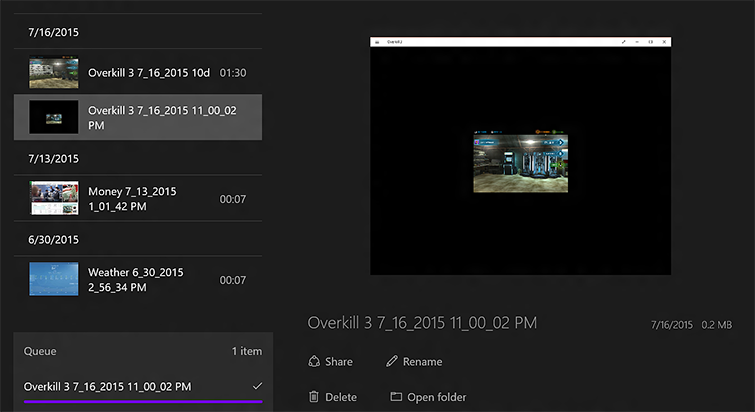 All game clips are stored in your Video\Captures folder on your PC. These clip files are stored as MP4 files and can be shared with any site that can host or share MP4 files. Next to See your game clips (Xbox One Only), select who you want to share with, whether it’s Everybody or just your Friends, or you can choose to completely Block this feature. Would you like to contact Support regarding the "Edit and share game clips with Game DVR on Windows 10" issue you were reading about or a different issue?